NYRB Classics. Hardcover. 1590170423 New Condition. . New. NYRB Classics. Hardcover. 1590170423 Like New Condition. . Fine. New York: New York Review Books, 2003. First edition. Hardcover. Fine/fine. Small 8vo. xliv, , 74 pp. Bound in speckled boards in illustrated dust wrapper. Black and white frontispiece and 6 pages of black and white illustrations. Introduction by Paul Auster. Fine in Fine dust wrapper, bright, crisp copy. NYRB Classics. Hardcover. 1590170423 . New. NYRB Classics. Hardcover. 1590170423 Special order direct from the distributor . New. NYRB Classics. Hardcover. 1590170423 Minor shelf wear . Very Good. NYRB Classics. Hardcover. 1590170423 signs of little wear on the cover. . Very Good. NYRB Classics. Hardcover. 1590170423 Brand New ,Original Book , Direct from Source , Express 5-8 Business days worldwide Delivery. . New. NYRB Classics. Hardcover. 1590170423 *BRAND NEW* Ships Same Day or Next! . New. NYRB Classics. Hardcover. 1590170423 *LIKE NEW* Ships Same Day or Next! . Fine. NY: NY Review Books. VG in VG DJ. (2003). When Hawthorne's wife visited relatives near Boston, he remained behind with his 4-yr son Julian. This is an account of . their time together. .
NYRB Classics. Hardcover. 1590170423 Ships from Tennessee, usually the same or next day. . New. 2003. NY: New York Review Books. G in G DJ ex-library. (2004). 1st ptg. The story of how Nathaniel Hawthorne got along with his son after his wife and daughters left to visit relatives near Boston . 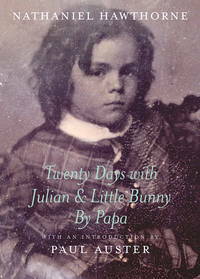 Twenty Days with Julian & Little Bunny By Papa. NY:: New York Review Books,. Fine in Near Fine dust jacket. 2003. Hardcover. 1590170423 . Introduction by Paul Auster. Second printing. Fine in a very near fine, price clipped dust jacket. .
NYRB Classics. Used - Like New. 2003. Hardcover. Small publisher's mark on text block. Fine. Dust jacket is Fine. NYRB Classics. Used - Very Good. 2003. Hardcover. Very Good. NYRB Classics. As New in As New dust jacket. 2003. Hardcover. 1590170423 . Introduction by Paul Auster. B/w illustrations. ; 12mo 7" - 7½" tall; 74 pp; New York Review Books . NYRB Classics. Used - Good. Former Library book. Shows some signs of wear, and may have some markings on the inside. NYRB Classics. Used - Good. Ships from Reno, NV. Shows some signs of wear, and may have some markings on the inside. 100% Money Back Guarantee. Shipped to over one million happy customers. Your purchase benefits world literacy! New York Review of Books, Incorporated, The, 2003. Hardcover. Very Good. Disclaimer:A copy that has been read, but remains in excellent condition. Pages are intact and are not marred by notes or highlighting, but may contain a neat previous owner name. The spine remains undamaged. At ThriftBooks, our motto is: Read More, Spend Less.Dust jacket quality is not guaranteed. NYRB Classics. Hardcover. 1590170423 Ships promptly from Texas. . Very Good. 2003. NYRB Classics. Hardcover. 1590170423 Hardcover with Dust Jacket. Book: Boards with shelf wear. Pages unmarked. Binding with no separations. DJ with edge wear. no tears **Tracking on all US orders. Most orders shipped within 24 hours. International customers will be reimbursed a portion of unused shipping charges.*** . Very Good. New York Review Books, 2003. Hardback. Very Good +/very good. NYRB Classics. Hardcover. GOOD. Spine creases, wear to binding and pages from reading. May contain limited notes, underlining or highlighting that does affect the text. Possible ex library copy, thatâll have the markings and stickers associated from the library. Accessories such as CD, codes, toys, may not be included.